Micah loved to be worn and I loved to wear Micah. He and I had months of snuggling to make up for after a sudden illness, when he was just five weeks old, left him critically ill and sent him into renal failure. I could not hold Micah for nearly five months because he was too unstable and was hooked up to too many medical devices. Surrounded by love, Micah slowly, very slowly, healed enough for me to hold him. As soon as I could, I wrapped Micah up and kept him next to my heart as often as possible. Life was complicated for Micah, who had zero kidney function, relied upon oxygen, and required a feeding tube. Nevertheless, babywearing allowed me to stay close to Micah, as I cared for his twin brother, pumped, and prepared his breastmilk to be tube fed to him. Micah was in the neonatal intensive care unit for three months, before he was moved to the pediatric intensive care unit, where he stayed for an additional seven months. My mom snapped this photo of the two of us, in Micah’s PICU room, the day before my 29th birthday and just one week before Micah came home for the very first time. Micah was the healthiest and strongest he had ever been and we were thrilled to be preparing to finally bring our sweet baby home after being in the hospital for 10 long months. Micah came home to us for four beautiful weeks, but then was re-admitted to the PICU because he caught a cold and didn’t have enough reserve to fight it off. Our hearts broke as we watched months of healthy progress slip away. One month after he was re-admitted, we lost our precious baby. Micah’s soul left this earth on December 11, 2012, yet his smile, strength and spirit are forever engrained in our hearts. Micah melted into me whenever I wrapped him. He was calm, content and knew he was so deeply loved. Babywearing kept us close and helped us make up for our months of separation. I miss my sweet baby Micah every moment of every day. It is a heartache that will stay with me until the day I die. Even so, my life is full of blessings. Micah’s twin, Zachary, is healthy and carries on Micah’s soul, love and spirit. 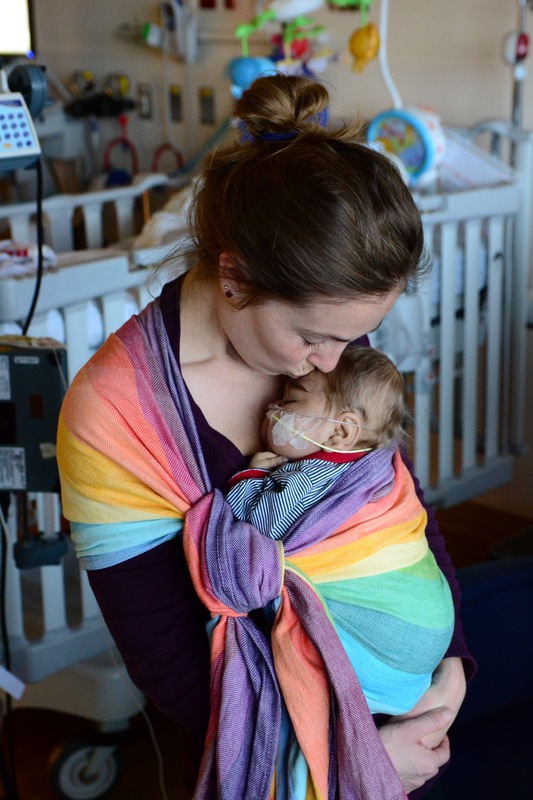 Our hearts are full knowing that Micah’s Rainbow keeps other babies close to the ones they love. By honoring Micah in beautiful, meaningful ways, we share the deep love, strength and inspiration that Micah so generously gave to all of us every day of his short life. You can read more about Micah and his family here: Micah’s Story and here “Micah Smiles“.